To make money in backgammon, you need two elements: (1) a skill advantage, and (2) good money management principles. Chabot explains money management for games in general and then goes on to show the adjustments needed for the game of backgammon. This means determining the proper size of your initial bet and handling the cube properly. 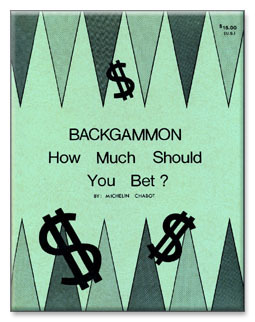 "In his book, Backgammon: How Much Should You Bet?, Michelin Chabot addresses two questions: the size of the stakes, and cube action. Citing formulas from Richard Epstein's The Theory of Gambling and Statistical Logic, Chabot develops principles for choosing the stakes. Chabot presupposed that you have a specific goal (e.g., winning $100) and a specific gambling capital you are willing to lose (e.g., $1000). Between these limits money is meaningless. Clearly there are very few real-life circumstances in which this is a rational set of values. In discussing cube actions, Chabot introduces the goal of maximizing hourly expectation, which is reasonable. If you have a large positive equity in the next game, it is worth passing a marginally sound take in a game which could last a very long time. But Chabot misapplies this concept. He assumes that during the rest of the hour the player will continually have backgammon positions as favorable as this one to play from. "Danny Kleinman, "Help for the Hustler?" Double Sixes from the Bar, 1982. AUTHOR: Michelin Chabot graduated from Sherbrooke University in the Province of Quebec (Canada) as a civil engineer in 1972. He played chess seriously from 1964 to 1976, but gave it up to devote himself entirely to backgammon. His first publication, Backgammon: How Much Should You Bet?, is the only comprehensive guide to establishing an appropriate bet. The theories are interspersed with clear, practical examples to illustrate the principles of wise money management. The book breaks new ground, and is therefore a much needed, long awaited manual in the world of backgammon.